Cass is such a lovely, nice natured girl. A little timid until she knows she can trust you but has now learnt that everyone she meets through us just wants to love her. She has really won the hearts of her many walkers. She loves to go for a walk, taking her time though as her joints aren’t as young as they were. She is on anti-inflammatory tablets to help with that problem. She has also had a couple of lumps on her mammary glands removed. One was benign but the other sadly malignant. We hope that if anything spreads further it will do so very slowly. She is in very good hands and will continue to enjoy walks with her fan club but we would dearly love her to soon be living in a nice home environment. We would continue to look after her medical treatment costs. 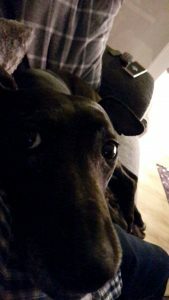 Great news, Cass is in a new home and doing really well! 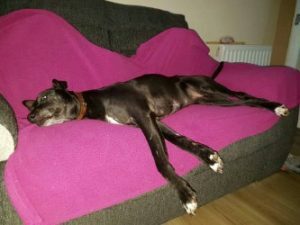 Cassie is now happily settled in her new home and enjoying all the home comforts she truly deserves. Cassie had a tumour removed from her mammory glands a little while ago and also takes tablets for her joints as she isn’t so young any more! As if she hadn’t already gone through enough a tumour was discovered on her tail almost as soon as she arrived in her new home. Being the truly resilient girl that she is though she took it all in her stride and is back to concentrating on taking all the best positions in the house and having her new ‘ Mum and Dad’ wait on her hand and foot! She receives regular visits from her favourite ex-walker and is now enjoying life to the full. Everyone loves her and why not- she is a real darling. We are so very pleased for her and say a big thank you to her ‘Mum and Dad’ for giving her such a lovely home. Cass is doing really well and her ‘Mum and Dad’ think the world of her. She has just received another visit from her favourite ex walker who is always pleased to go and see her and give her a fuss She says ‘Cass is looking wonderful’. So pleased for her. Still a few ailments that come to test her but she is such a wonderful girl and just gets on and enjoys life to the full. She has recently moved home so is no doubt investigating new areas to walk in and enjoy herself. A gorgeous girl with a lovely ‘Mum and Dad’ who still think the world of her. 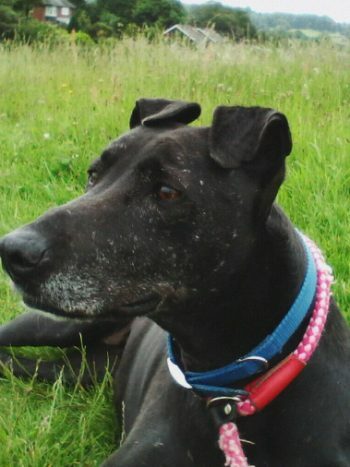 We are very sad to say that Cass has gone over the Rainbow Bridge today. She has been looked after so lovingly by her ‘Mum and Dad’ who are devastated to have had to say goodbye to her. We are so sad. She was a special girl who will always be remembered very fondly.